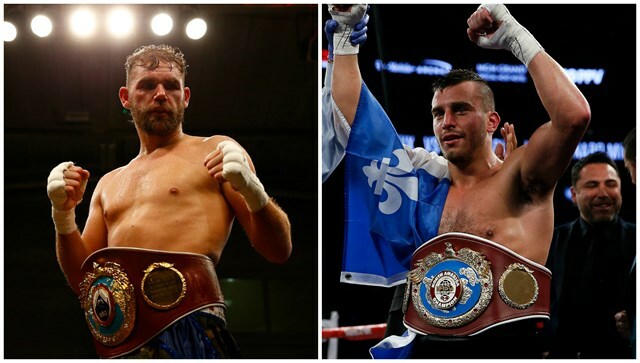 Saunders Dares Lemieux: Don't Talk Sh*t, Fight Me in December! WBO world middleweight champion Billy Joe Saunders (25-0, 12 KOs) has clashed with former IBF beltholder David Lemieux (38-3, 33 KOs) on Twitter, with Lemieux branding the Englishman a "coward". Last month, Saunders returned to the ring and won a solid twelve round unanimous decision over Willie Monroe Jr. at the Copper Box Arena wants to box again before the end of the year. "Waiting impatiently to receive some news on my next fight which should be December 2nd, excited and ready," Lemieux wrote on Twitter on Thursday morning. Saunders did not hold back in his reply: "P*ssy you was my mandatory and you was saying you was injured. Come fight me now." "We did make you guys an offer but you're overpricing yourself, another way of saying no, you coward. When I fight you - you're ending in hospital," warned the Canadian. "Make me a offer," responded the champion. "Don't talk sh*t, come over for December. I hold the title, you come to UK." This was not the first time the two have clashed on Twitter. Back in June the pair traded blows when Saunders was hoping to secure an opponent for September. Canelo Alvarez and Gennady Golovkin look likely to face each other in a rematch next on a date in May 2018, so for now Saunders wants to fight again in December before hopefully securing a unification with the winner next summer. Lemieux, a heavy-handed come-forward fighter, is highly ranked in the division and a bout with Saunders would draw huge interest on both sides of the Atlantic.